StrongVPN Review - Australian VPN Review + A FREE GIFT! GET YOUR FREE ﻿GIFT DIRECTLY TO YOUR INBOX! Enter your details below to receive it now! Welcome to our StrongVPN review, where we investigate another offering in the VPN line. A VPN is a service that improves internet security and allows you to bypass censorship other Internet restrictions, by creating an encrypted connection between your computer and the VPN server. Read here (http://www.australianvpn.com.au/what-is-a-vpn/) for more information on what a VPN is and what it can do for you. StrongVPN offers access to servers in 45 cities in 21 countries, including several in the US and the UK. They don’t have any servers in Australia, which may cause problems for those who only need a VPN to protect their data while, for example, gaming online, instead of pretending to be in a different country, and can lead to high pings and slow download speeds. Their service is a bit on the pricey side, and will run you US$10/month if you bill monthly, or US$5.83 if you choose annual billing. They offer a 5-day money back guarantee, if you decide that their service is not the right one for you. They also offer an impressive selection of routers that come with their software preinstalled, starting at US$239. Having your VPN installed on your router will allow you to connect your household devices to the VPN quickly, easily, and automatically. The prices are in US dollar, so you should keep in mind that your bill may fluctuate due to changes in the exchange rate. Their package allows simultaneous access on only two devices, and they offer apps for most major OSs – Windows, Mac, iOS, and Android. They have no bandwidth limitations, but they do limit the number of server switches per month, and allow their users to make use of P2P services. They offer a side service, StrongDNS, to protect against DNS leaks, man-in-the-middle attacks, filtering, and other DNS-based attacks. Since their version is a separate account that will run another US$5/month, while other VPN services offer their DNS protections as part of their VPN package or at a slight surcharge, however, this is not a point in their favour. It is nice that you can buy their DNS service on its own, but it would have been better if some version of the StrongDNS service had been included with the basic StrongVPN package. During StrongVPN review testing, the service did not have a very negative impact on download speeds and pings, placing it solidly near the top on that front. Their Android app is good-looking and well-designed, and makes setting it up and connecting very easy. It runs smoothly with no crashes, bugs, or strange errors, and is quick and responsive. Their Windows app, however is very old-fashioned and should look familiar to users of older versions of Windows. It works perfectly well and is very customizable for those who like to tinker, while also having enough automation to make it usable for the beginner, but it still looks old. If you are a fan of the newer versions of Windows, and like to have everything clearly laid out and easy to find, in bright colours, this may not be the app for you. If, on the other hand, you have a lot of technical knowledge and want to set up your VPN in every detail, this may be exactly the application you’ve been looking for. No bandwidth charges or speed limits. Data scrambler. StrongVPN’s Windows and Android applications include a Data Scrambler feature for additional security. Multiple protocols supported. They offer support for OPenVPN, IPSec, PPTP, L2TP and SSTP. Routers. They offer a range of routers for sale that come preinstalled with their software. Zero-logging policy. They log no information about clients’ usage. Separate DNS service. StrongVPN also offers StrongDNS, a DNS protection service, as a separate service. Useful, if you only want protection against DNS filtering. 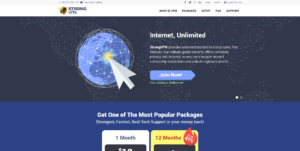 All in all, this StrongVPN review has to conclude that StrongVPN, while an impressive service on the face of it and with a very long track record (The company was founded in 1994), is perhaps not the best on offer. It’s more expensive than many others, and looks rather feature-poor compared to other offerings we’ve seen lately. On the other hand, if what you’re looking for is a bare-bones VPN with a long history and an excellent reputation, StrongVPN may be exactly what you’re looking for. A lack of Australian servers really hurts, as we are reviewing this product for Australians having access to Australian servers is a ‘must have’ feature. Apart from that, speed is good, privacy is excellent, but the prices are a little bit expensive when compared to other offerings.